Partho Gupte is an Indian child actor who made his debut in the film Stanley Ka Dabba in 2011. He was awarded a Filmfare Special Award for his performance. Maharashtra is a state in the western region of India. It is the second-most populous state and third-largest state by area in India. Spread over 307,713 km2 (118,809 sq mi), it is bordered by the Arabian Sea to the west, the Indian states of Karnataka and Goa to the south, Telangana and Chhattisgarh to the east, Gujarat and Dadra and Nagar Haveli to the north west, and Madhya Pradesh to the north. It is also the world's second-most populous subnational entity. It was formed by merging the western and south-western parts of the Bombay State, Berar and Vidarbha, and the north-western parts of the Hyderabad State and splitting Saurashtra by the States Reorganisation Act. It has over 112 million inhabitants and its capital, Mumbai, has a population around 18 million making it the most populous urban area in India. Nagpur hosts the winter session of the state legislature. Pune is known as 'Oxford of the East' due to the presence of several well-known educational institutions. The Mumbai International Film Festival for Documentary, Short and Animation Films (MIFF) is a festival organized in the city of Mumbai by the Films Division, Ministry of Information and Broadcasting, Govt. of India. It was started in 1990, and focuses on documentary, short fiction and animation films. Won: Best Editing - Rock On!! Won: Best Editing - Kai Po Che! Kai Po Che! is a 2013 Indian buddy drama film directed by Abhishek Kapoor based on Chetan Bhagat's novel The 3 Mistakes of My Life, with music by Amit Trivedi and lyrics by Swanand Kirkire. Sushant Singh Rajput, Rajkummar Rao and Amit Sadh star as the three main protagonists while Amrita Puri plays the female lead. The film title Kai Po Che! is originally a Gujarati phrase that means "I have cut" which refers to Makar Sankranti where one of the competitors uses his kite to cut off another competitors kite and yells "Kai Po Che!" The shooting started mid-April in Vadnagar and Ahmedabad. Thelma Colbert Schoonmaker is an American film editor who has worked with director Martin Scorsese for over fifty years. She started working with Scorsese on his debut feature film Who's That Knocking at My Door (1967), and edited all of Scorsese's films since Raging Bull (1980). Schoonmaker has received seven Academy Award nominations for Best Film Editing, and has won three times—for Raging Bull (1980), The Aviator (2004), and The Departed (2006). Palagummi Sainath is an Indian journalist and photojournalist who focuses on social & economic inequality, rural affairs, poverty and the aftermath of globalization in India. He is the Founder Editor of the People's Archive of Rural India. He was the Rural Affairs Editor at The Hindu before resigning in 2014, and the website India Together has been archiving some of his work in The Hindu daily for the past six years. Bhoot is a 2003 Indian supernatural horror film directed by Ram Gopal Varma and stars Ajay Devgn and Urmila Matondkar in the lead roles. It was the second horror film made by Ram Gopal Verma after Raat. It was perceived to be different from a typical Hindi film as it did not contain songs. It was later dubbed in Telugu as 12 Va Anthasthu and remade in Tamil as Shock. The film was a box-office hit. Urmila won several accolades and awards for her performance as a ghost possessed wife. Verma made a sequel called Bhoot Returns which was released on 12 October 2012. Shriya Saran (pronounced [ʂrɪjaː sərən], also known as Shriya, is an Indian actress and model known for her work in South Indian cinema, Bollywood and American cinema. Saran was born in Dehradun and spent most of her childhood in Haridwar. In 2001, her dance master gave her the opportunity to appear in Renoo Nathan's debut music video "Thirakti Kyun Hawa", which brought Saran to the attention of many Indian filmmakers. Although Saran aspired to become a well-known dancer, she was offered a leading role. Thus, Saran made her film debut in 2001 with the Telugu film Ishtam, and had her first commercial success with Santhosham. Taare Zameen Par is a 2007 Indian drama film produced and directed by Aamir Khan. The film explores the life and imagination of Ishaan, an 8-year-old dyslexic child. Although he excels in art, his poor academic performance leads his parents to send him to a boarding school. Ishaan's new art teacher suspects that he is dyslexic and helps him to overcome his disability. Darsheel Safary stars as 8-year-old Ishaan, and Khan plays his art teacher. Creative director and writer Amole Gupte initially developed the idea with his wife Deepa Bhatia, who served as the film's editor. Shankar–Ehsaan–Loy composed the film's score, and Prasoon Joshi wrote the lyrics for many of the songs. Principal photography took place in Mumbai and in Panchgani's New Era High School, and some of the school's students make appearances. Darsheel Safary is an Indian actor. He played the lead role in Taare Zameen Par. Manjari Fadnnis is an Indian actress who has appeared in Hindi, Telugu, Bengali, Tamil, Kannada, Malayalam and Marathi language films. She is best known for her performance in the 2008 Hindi film Jaane Tu... Ya Jaane Na. Her other notable films are Faltu (2006), Zokkomon (2011), Grand Masti (2013), Kis Kisko Pyaar Karoon (2015) and a short film Khamakha (2016). She is currently working with Ashvin Gidwani Productions on a theatrical adaptation of Devdas. 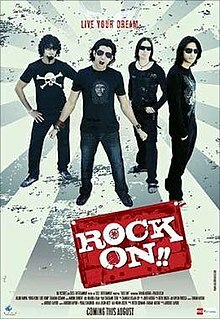 Kaminey is a 2009 Indian caper action film directed by Vishal Bhardwaj and featuring Shahid Kapoor, Priyanka Chopra and Amol Gupte in the lead roles. Set against the backdrop of the Mumbai underworld, Kaminey follows a rivalry between a pair of twins, one with a lisp and the other with a stutter, over the course of a single day. Kireet Khurana is an Indian filmmaker, storyteller, and ad-film director. He graduated from Sheridan College in Canada with high-honors. After graduating, he founded the production house Climb Media, and later its animation wing, 2nz Animation Co., where he serves as creative head. Ankur Bhatia is an Indian actor and model. He grew up in Bhopal, India and currently resides in Mumbai and New York. He made his acting debut in 2010 in Payal Sethi's Grant St. Shaving Co which was produced by Mira Nair. In 2012, he won the Best Actor Commendation Award at the NYU Tisch School of the Arts Film Festival for Coconut Grove. In 2013, Ankur played a negative role in a Bollywood/Tollywood film Zanjeer /Toofan, remake of Zanjeer. He appeared in Apoorva Lakhia's Haseena, starring Shraddha Kapoor, which was released in the theatres on 18 August 2017. Kim Roberts, A.C.E., is an American filmmaker who has worked primarily on documentaries as a film editor and writer. Roberts has a master's degree in documentary film production from Stanford University (1996). Her first credit as an editor was for Long Night's Journey into Day (2000), which was directed by Deborah Hoffmann and Frances Reid and that was nominated for the Academy Award for Best Documentary Feature. She was credited as both an editor and writer for Great Wall Across the Yangtze (2000), which was directed by Ellen Perry. Her work since then and several of her honors are sketched in the filmography below. Roberts was featured in a New York Times article on film editing in 2012. She has been selected for membership in the American Cinema Editors, which entitles editors to append "A.C.E." to their film credits. Aaron I. Butler is an American film and television editor and producer. ↑ "Roast of Patriarchy | Latest News & Updates at Daily News & Analysis". dna. 2016-11-19. Retrieved 2017-09-26. 1 2 "Film editor Deepa Bhatia to turn director". The Indian Express. 2014-08-22. Retrieved 2017-11-25. ↑ "'Sachin: A Billion Dreams': You don't have to be a cricket fan to love the biopic". The News Minute. 2017-05-26. Retrieved 2017-11-25. 1 2 "EDITOR'S CUT". epaper.timesofindia.com. Retrieved 2017-09-26. ↑ Ramnath, Nandini. "Documentary 'Placebo' offers a dose of student life, and it isn't easy to swallow". Scroll.in. Retrieved 2017-09-26. ↑ "'Zubaan': Busan Review". The Hollywood Reporter. Retrieved 2017-09-26. Vij, Gauri. "A leap of faith" The Hindu , 3 February 2008.